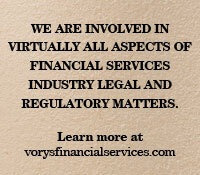 Vorys knows the financial services industry and understands its challenges. We represent more than 150 financial institutions and we are deeply involved in virtually all aspects of industry legal and regulatory matters. Our legal team is comprised of more than 100 industry practitioners with hands-on experience. Our ranks include a partner who has over 20 years of experience as a general counsel and executive officer of several large bank holding companies and is a co-author of a nationally recognized handbook for bank and thrift directors. We publish bulletins on important industry issues as they arise, as well as an industry-recognized quarterly newsletter. Importantly, we take a unique and effective interdisciplinary team approach to industry issues based on extensive hands-on industry experience and decades of industry work. That work and experience enables Vorys to provide a unique combination of services to the industry and to partner with our clients to provide support in a practical and cost-effective manner. Vorys ranked 7th nationally in the number of financial institution M&A transactions in 2013 according to SNL Financial. Vorys has been selected as a “Go-To Law Firm” for 11 consecutive years in American Lawyer Media’s survey of in-house counsel at the 500 largest U.S.-based companies, including financial services companies. Vorys ranked as a national “Best Law Firm” in banking and finance by U.S. News - Best Lawyers. RHome City Financial Corporation in its sale to Richwood Bancshares, Inc.